Sending sympathy flowers or plants to someone in United Kingdom is a traditional gesture of comfort and affection that lets them know that they are not alone at such a tragic time. Flowers are the most common form of expressing sorrow & support to the bereaved, not only have a calming effect, but a fortifying one as well. Send condolence flowers as soon as you hear of the death are quite appropriate. We advise selecting flowers like White Asiatic lilies, White Roses, Alstromerias in shades of pale Peach, Carnations that will show the family that you are thinking of them and their lost loved one. 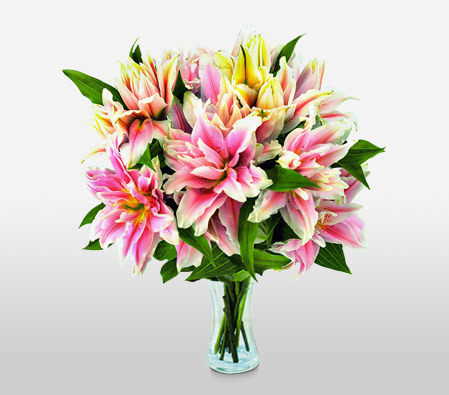 When sending sympathy flowers to the funeral home select either a Standing Funeral Spray or a Wreath, and if you are sending sympathy flowers to someone’s home select a Sympathy Basket, Casket Sprays or a Lily Sympathy Plant. Remember sending of sympathy flowers possesses its own particular etiquette. It's important to know where and when to send them in order to avoid having them arrive at an inappropriate time or place.